Ed Dolan's Econ Blog: Comparing the Ukrainian and Russian Economies. How will Ukraine's Weakness Affect Voters? Comparing the Ukrainian and Russian Economies. How will Ukraine's Weakness Affect Voters? Last month residents of Crimea voted to secede from Ukraine and join the Russian Federation. 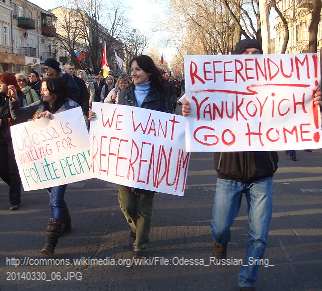 Although many in the West have questioned the freedom and fairness of the referendum, which was held in the intimidating presence of Russian troops, no one doubts that many Crimean residents did have a true preference for the Russian option. Historical, linguistic, and cultural considerations were presumably decisive for many voters, but according to reports, economic factors also played a role. By conventional indicators, Russia is a much wealthier country than Ukraine. According to the latest data from the IMF, Russia’s per capita GDP, measured at purchasing power parity, was $17,884 in 2013. That is nearly two-and-a-half times higher than the $7,423 per capita for Ukraine. Russian wages and pensions are correspondingly higher. Russian Prime Minister Dmitry Medvedev made a point of flying to Crimea soon after the vote to announce in person the decision to raise pensions and wages for government employees to Russian standards.